Connecting and serving investors, real estate professionals, and homeowners. Monthly Meetings, Networking and Quality Real Estate Investor Education since 1996. Our goal is to equip you with a deep and broad knowledge base, elevate your skill set, and help you build a wholesaling machine! If you execute our plan, take action and follow through, you will wholesale deals. If you’re already wholesaling, you will learn how to take it to the next level. The exciting opportunity to learn the business while partnering on deals with local, experienced investors. We work directly with you unlike the out-of-town gurus who send you to a call center with scripts. You can call us, email us and see us at the office. We do deals and so can you! 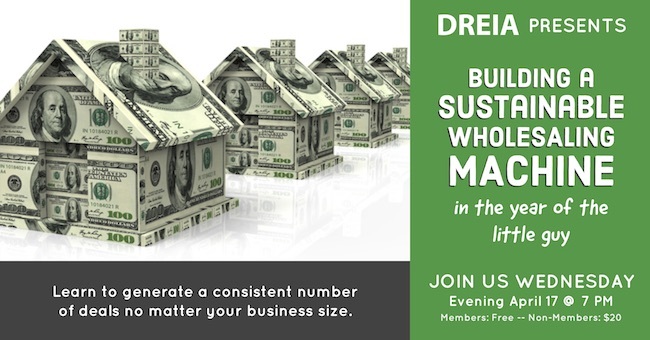 DREIA offers resources to anyone who is serious about growing their real estate investment expertise. Our membership includes full-time and part-time investors, beginning investors, real estate brokers and agents, business associates, attorneys, accountants, property managers, contractors, renovation specialists, appraisers, bankers, and people just like you who want to earn better returns on their time and investments starting today.